Run the Xterra, Rotorua Half Ironman, Rotorua Marathon, the Redwoods Half Marathon, cycle the NZO N-Duro mountain biking series, play golf, go trout fishing, catch an event at the International Stadium or simply enjoy your day in our thermal adventure land then come home to catch up on your emails from your own broadband connection and relax in your well appointed accommodation. Beautifully appointed, self contained, two bedroom apartment for 4 with views over Springfield Golf Course. Deck on two sides so you'll catch the sun from early morning to sunset. Newly furnished peaceful double bedroom opening onto garden. Own en-suite bathroom, fridge and tea & coffee making facilities. Let us know if you have any special requirements or bookings you would like us to make for your visit. A minimum stay of 2 nights usually applies. Special conditions may apply at holiday weekends and peak periods. We operate a non smoking policy. Bookings of one night attract a surcharge of $55.00. The en-suite room is located on the ground floor of the main house. It has its own external access and provides a useful extension for a party of 6 or a single or double not requiring cooking facilities. $155 for 2 people per night (king) and includes provisions for a continental breakfast. 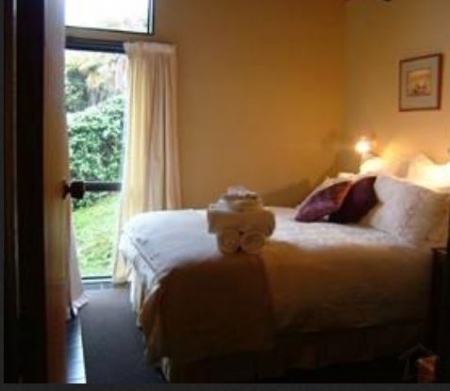 $175 for 2 people per night (twin singles) and includes provisions for a continental breakfast. A minimum stay of 2 nights usually applies at weekends and holidays and we operate a non smoking policy. There is no surcharge for one night bookings. Bookings for both the apartment and the en-suite room attract a discount for the en-suite room. Apartment (1 bedroom) plus superking en-suite room, is $275. Apartment (1 bedroom) plus twin singles en-suite room, is $295. Apartment (2 bedrooms) plus superking en-suite room, is $300. Apartment (2 bedrooms) plus twin singles en-suite room, is $325. We are happy to pick you up or drop you off at the airport. Each transfer is $20.